This card trick is SURE TO IMPRESS!!! Is it possible to make a selected card appear in a bottle inches from a spectator’s eyes? Find out by joining Eddy Ray and learn all of the secrets. 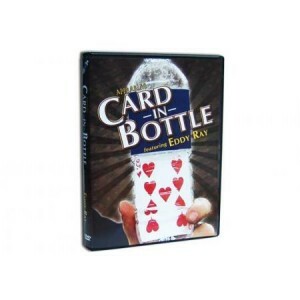 On this DVD Eddy Ray will teach you a dozen visual effects, tricks and routines using an ordinary bottle. You’ll learn step-by-step with clear detailed teaching so that you’ll be able to add this incredible magic into your repertoire. This post is actually a pleasant one it assists new the web users, who are wishing for blogging. Thanks for finally talking about >Discovery Card Trick <Loved it! I am actually delighted to read his web site posts which includes plenty of helpful data, thanks foor providng these kinds of statistics.